Can What We Eat Affect Our Kids? What is epigenetics? For me, the first stages of understanding came a while back. When I was a young graduate student (which is more than just a few years ago), I was taught that all genetic information resided in our DNA. During conception, we picked up some DNA from our dad and some from our mom, and that DNA was what made us a unique individual. We knew that environmental influences such as diet, lifestyle and exposure to toxic chemicals could affect our health personally. However, we never dreamed that the effects of those environmental influences could actually alter our gene expression, and that those genetic alterations could be passed on to our children. Today we know that environmental influences can actually modify our DNA and that those modifications can be passed on to our offspring – a process called epigenetics. What Is Epigenetics & How Does It Affect Gene Expression? These alterations can turn genes on and off. 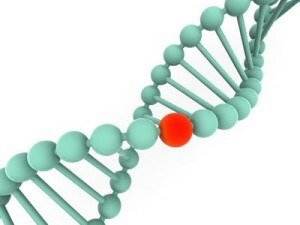 That means that epigenetic modifications can alter gene expression. In a previous “Health Tips From the Professor” article titled “Can Diet Alter Your Genetic Destiny?” I discussed recent research suggesting that a healthy diet and lifestyle causes epigenetic changes in the DNA that may reduce your risk of heart disease, cancer and diabetes. As is often the case, the first definitive study showed that epigenetic changes were heritable was an animal study. This study was done with a mouse strain called agouti (Waterman and Jirtle, Mol. Cell. Biol. 23: 5193 – 5300, 2003). Agouti mice can have two remarkably distinctive phenotypes. They can either have a yellow coat, become obese as adults and be prone to cancer and diabetes as they age or they can have a brown coat and grow up to be lean and healthy. It had been known for some time that these phenotypic differences were controlled by the epigenetic methylation of a specific gene called the agouti gene. The agouti gene codes for a genetic regulator that controls coat color, feeding behavior, and body weight set-point, among other things. When the agouti gene is under methylated it is active. As a consequence the mice have yellow coats and are prone to obesity. When the agouti gene is highly methylated it is inactive. The mice have brown coats and are lean and healthy. Moreover, methylation of the agouti gene is not a purely random event. 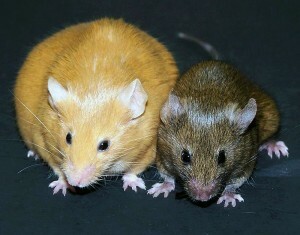 Mothers with the yellow, obese phenotype tended to produce a preponderance of offspring with the same phenotype and vice-versa. In short, the epigenetic methylation pattern of the agouti gene could be passed from generation to generation. It was heritable. Waterman and Jirtle’s research broke new ground by showing that the methylation of the agouti gene could be strongly influenced by what the mother ate while the fetal mice were still in the womb. When they fed agouti mothers a diet with extra folic acid, B12, betaine and choline (all nutrients that favor DNA methylation) during conception and pregnancy the agouti gene of their offspring became highly methylated. A high percentage of those offspring had brown coats and grew up to be lean and healthy. However, when Waterman and Jirtle put agouti mothers on a diet that was deficient in folic acid, B12, betaine and choline during conception and pregnancy the agouti gene of their offspring was under methylated. Many of those offspring had yellow coats and grew up to be fat and unhealthy. Addition of genistein, a phytonutrient from soy, to the maternal diet also favors methylation of the agouti gene and protects against obesity in agouti mice (Dolinoy et al, Environmental Health Perspective, 114: 567-572, 2006). The addition of the environmental toxin bisphenol A to maternal diets causes under methylation of the agouti gene and predisposes to obesity in agouti mice, but this effect can be reversed by also feeding the mother genistein or folic acid and related nutrients during pregnancy (Dolinoy et al, PNAS, 13056-13061, 2007). The agouti mice studies provide a dramatic example of how diet and environmental exposure during pregnancy can cause epigenetic changes in fetal DNA that have long term health consequences for the offspring. However, they are animal studies. Does the same hold true for humans? With humans, it is really difficult to determine whether epigenetic changes that occur during conception and pregnancy affect our children. That is because when you measure an epigenetic effect in a child or adult, it is difficult to sort out how much of that effect was caused by what the mom ate during pregnancy and how much was caused by how the family ate as the kids were growing up. Unfortunately, there is a tragic human experiment that shows that the same kind of epigenetic changes are heritable in humans. I’m referring to what is known as the “Dutch Hunger Winter”. This was a period of starvation during 1944-1945, the final year of World War II, when the Germans set up a blockade that prevented food from reaching western Holland. During that few months even pregnant women were forced to live on food rations providing a little as 500 calories a day. This was an event without parallel in human history. 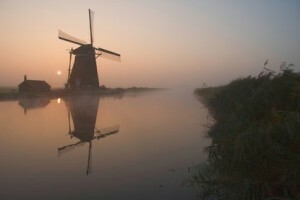 Holland is not a third world country. Once the blockade was lifted children born during the Hunger Winter had the same plentiful supply of food as every other Dutch citizen. This has allowed generations of research scientists to ask what were the effects of a brief exposure to malnutrition during conception and pregnancy. The health consequences were dramatic. 50 years later individuals who were conceived during the Hunger Winter weighed about 14 pounds more, had waists about 1.5 “ larger, and were three times more likely to have heart disease than those born to mothers who were in their second or third trimester of pregnancy during that time. By the time they reached age 63, they experienced a 10% increase in mortality. What caused those health consequences? Could the cause have been epigenetic? Recent research suggests that the answer might be yes. A distinct pattern of DNA methylation was observed in survivors who were conceived during the Hunger Winter. This pattern of DNA methylation was not observed in survivors who were in their second or third trimester during the Hunger Winter. It was also not seen in people who were conceived immediately before or after the Hunger Winter. Some of the genes with distinctive methylation patterns were genes that affected things like cholesterol levels and insulin sensitivity, which have the potential to increase disease risk. Other genes with distinctive methylation patterns were genes that affected metabolism. They were “thrifty” genes that increased the efficiency of metabolism. Increased efficiency of metabolism is beneficial when calories are scarce, but can lead to obesity when calories are plentiful. That is a truly remarkable finding when you think about it. If these data are true, they suggest that starvation during early pregnancy caused the fetus to make epigenetic changes to its DNA that allowed it to become more efficient at energy utilization, and those epigenetic changes have lasted a lifetime – even when food was abundant throughout the rest of that lifetime. What Is Epigenetics And Can What We Eat Affect Our Kids? The studies I featured in this article are powerful “proof of concept” that diet and environmental exposure during conception and pregnancy can result in epigenetic changes to the DNA of the offspring that can persist throughout their life and dramatically affect their health. However, it is not yet clear how they apply to you and me. Agouti mice are a very special strain of mice. It is not yet clear what effect folic acid, genistein and bisphenol A have on epigenetic modification of specific human genes, and whether those epigenetic modifications will have health consequences in humans. The specific circumstances of the Dutch Hunger Winter are unlikely to be repeated on any significant scale. The closest approximation I can envision would be a woman who becomes pregnant while on a very low calorie fad diet. When female rats are maintained on a “junk-food diet” high in fat and sugar during pregnancy and lactation their offspring show a marked preference for high fat foods (Ong & Muhlhausler, FASB J, 25: 2167-2179, 2011). They also show epigenetic alterations of the central reward pathways that may pre-condition them to require higher intakes of fat to experience pleasure from eating. When rats are fed diets deficient in omega-3 fatty acids, adolescent rats from the second and subsequent generations display marked increases in hyperactivity and anxiety (For more details, see my “Health Tips from the Professor” article titled “The Seventh Generation Revisited”. In a clinical trial of 162 obese Canadian mothers who had children before and after weight loss surgery, the children born after weight loss surgery were half as likely to grow up overweight or obese as the children born before the weight loss surgery (Smith et al, Journal of Clinical Endocrinology & Metabolism 94: 4275-4283, 2009), and this correlated with epigenetic modification of genes that play a role in obesity, diabetes, cancer and heart disease (Guernard et al, PNAS 110: 11439-11443, 2013). Taken together, the existing data suggest that our diet and environmental exposure during conception and pregnancy can cause epigenetic changes to our children’s DNA that may affect their future health in ways that we can only begin to understand at present. It is a sobering thought. The term epigenetics describes modifications to our DNA that turn our genes off and on. In this article I discussed two powerful “proof of concept” studies, one in rats and the other in humans, showing that diet and environmental exposure during conception and pregnancy can result in epigenetic changes to the DNA of the offspring that can persist throughout their life and dramatically affect their health. The health consequences of these epigenetic modifications include obesity, diabetes, cancer, heart disease, hyperactivity, anxiety and many more. This is a new paradigm. Most prenatal nutrition advice is currently based on what it takes to have a healthy baby – not on what it might take for your child to experience better health throughout their life. Of course, the science of epigenetics is relatively new. It will be many years before we will be able to make specific recommendations as to what your diet should be like during pregnancy and lactation if you wish to make beneficial modifications to your baby’s DNA. However, you should be aware that what you eat during pregnancy & lactation may influence the health of your children – not just at the time of their birth – but throughout their life, and that a high calorie, “junk-food” diet or a fad weight loss diet just may not be your best choice. *The agouti mice picture is by Randy Jirtle and Dana Dolinoy (E-mailed by author) [CC BY 3.0 (http://creativecommons.org/licenses/by/3.0)], via Wikimedia Commons. I have long wondered why a beautiful, gifted mom and wife of 5 gifted children, is morbidly obese. She is in her 40’s and struggling for life from cancer. Doctors have given up on her…..so very tragic! This may be the answer, her mom is also morbidly obese. Her one sibling is moderately overweight. Thank you for all you do.